if you are lucky enough to live in brooklyn, close to di fara, you have the opportunity to eat, daily if you so desire, a pizza that will cause you to jump up and down with pleasure during and after each bite: the tremendous heat (more than 700F) of a commercial pizza oven cooks the pie in just a couple of minutes. this short, intense burst of dry heat yields a pizza crust that is lightly charred on the underside and on the rim, moist and tender within, light and airy, chewy yet crisp, with sauce and toppings bubblingly-hot but not yet desiccated. if urban manhattan is not your domicile, and you have high standards for your pizza, you may be forced to go to great, often costly, lengths. fortunately, there is an inexpensive, easy, and incredibly effective solution to this problem. we tested it tonight (making it 8 runs in total) and can confirm that there is, indeed, jumping up and down with pleasure both during and after each bite, and sounds of pleasure also. detailed instructions for this pizza follow, after a brief discussion of process. this is the result of experiment 7.
fresh tomato sauce with garlic, basil, and pesto blobs. left it in the oven maybe 30 sec longer than we should have, hence the excessive charring on top. the second pizza we made, which we didn't photograph, was perfect. perfect. achieving a high-temperature cooking base to crisp the bottom of the pizza. achieving a high-temperature cooking environment to rapidly cook the top of the pizza. buying or building a pizza oven much like a serious pizza restaurant would have. while solving both problems, this solution is not feasible for those with insufficient room (or sufficient floor bracing) for an 800-pound brick structure. using a pizza stone. these stoneware discs are usually 1/2" to 3/4" thick and take about 80 minutes to heat up fully (ie, for the thermal mass to reach saturation) in a very hot oven. this solves problem 1, but in a spectacularly energy-inefficient way. investing in specialized home pizza-oven machines that surround the pie with ample heat. perfect, but at what price? also, i despise equipment that has only one purpose. does a cast-iron skillet have enough thermal mass to cook and lightly char a pizza base if thoroughly preheated, then taken off heat? does a broiler generate enough radiant heat and hot air to cook and lightly char a pizza top fast enough to not dry it out? can a preheated skillet and broiler be combined to produce pizza awesomeness? the answer to all three questions, as it turns out, is yes. a broiler and a cast-iron skillet in combination are the easy secret to a light, airy, moist, chewy, crisp, lightly-charred pizza without an expensive wood-fired oven or a potentially-expensive experiment with your home oven's safety lock. this pizza will not be nearly as good as something baked in under a minute in a roaringly-hot pizza oven but it comes awfully close, all things considered. after several trial runs, i am ready to share the following learnings with you. [4-6 days before you want pizza] prepare a good dough and allow it to mature. i can add nothing to jeff varasano's minutely-detailed recipe and instructions. shape into single serving balls of dough and allow to mature in the fridge. 60-80 minutes before you want your pizza, take the dough out. lightly coat each ball of dough in oil a separate bowl and leave to warm up to room temperature and double in size. do not neglect the oil, as it prevents the dough from adhering inconveniently and frustratingly to the bowl later on. if the dough appears laggardly (ie, if it isn't doing much of anything after 20-30 minutes), placing it in a gently-warmed oven helps accelerate the process: switch on the oven for a minute, then shut it off and open the door to vent hot air before placing the dough inside. do not use this dough until it has at least doubled in volume (this may be a smaller visual change than you expect; be vigilant and remember that volumetric expansion is less dramatic). prepare your sauces and toppings. have a spoon for every sauce and all the toppings grated, cut, and ready for extremely rapid deployment. prepare your broiler drawer by putting baking sheets or other heat-proof objects into the broiler drawer. the skillet will rest upon these objects, and the intent is to raise the skillet as close to the broiler heating element as possible without touching the element. you should be able to slide the skillet into the broiler easily. this is an important step that you should not neglect. when all is in readiness, turn on the broiler and begin preheating the dry, ungreased skillet on the stovetop on the highest flame setting. the skillet should preheat for 8-10 minutes to reach thermal saturation. as soon as you begin heating the skillet, lightly flour a wood cutting board or (better yet) a pizza peel. if you flour too assiduously, there will be flour pockets under the pizza when it is baked. these will burn and become bitter, while robbing your crust of the slightly charred patches that make it crisp, yet tender. [note that everything in step 6 should happen within 3-4 minutes, at most.] 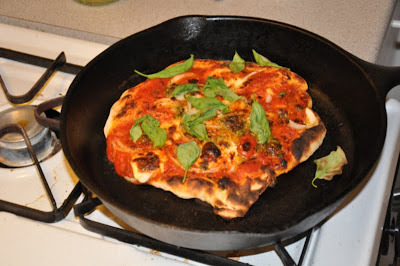 with about 4 minutes of skillet heating to go, begin to shape your pizza. scoop a ball of risen dough out of its bowl, taking care to deflate it as little as possible. holding it gently by an edge, allow gravity to stretch it out. move around the edge so that the ball of dough becomes a thin disk with a slightly thicker edge all around. speed here is of the essence. lay the disk on the floured board and shake the board from side to side to prevent the dough from sticking. immediately sauce it lightly, being careful not to deflate the dough by pressing down with your saucing spoon, then add toppings. speed, not perfection, is the objective: if you dally, the wet dough will stick to your board and be impossible to slide onto the hot skillet. because the pizza cooks so quickly, a small amount of sauce will remain moist and delightful and allow the crust underneath to aerate. slide the pizza onto the skillet. you may find that having another pair of hands to guide the leading edge of the pizza onto the skillet helps. there is no way to get this right without practice or to describe in words the experience of sliding a damp, soft, floppy disk of dough covered in liquids onto a smoking iron skillet. your first pizza is likely to be a mess, but you should bake it anyway. persevere, but clean the charred bits off the skillet before you do so. 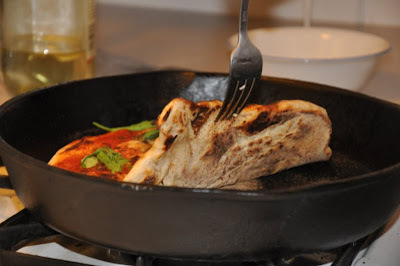 when your pizza is in the skillet, immediately take the skillet off the flame and place it in the preheated broiler with the handle of the skillet pointing as far to one side of the oven as possible. close the broiler door as quickly as possible. place a heatproof dish into the main oven compartment (not the broiler) to warm up. after 45 seconds, rotate the skillet so that the handle points to the opposite side of the oven. after 1 minute 30 seconds, pull out the pizza to see if the unsauced rim has begun to char lightly. if not, push the skillet back in and cook for another 20 seconds, then check again. if your broiler runs cool, your pizza may take up to 3 minutes to cook. when cooked, take the pizza out of the broiler and place it on the now-warm plate you put in the oven in step 7. * for a full account, see jeffrey steingarten's amusingly self-deprecating review article.